I grew up in a small town in Imperial County, California. Life was pretty steady there. Surrounded by a vast desert, television and high school was pretty much the only exciting part of life. Life was acceptable. It fit a mold, and if you had a job, a home, and a family, then you were successful. I went to college in San Diego, graduated, and then became a nurse some years later. I found a wife, had kids, and bought a house. I settled down. I pursued what I was told was my purpose. My life was now officially a success. In the twenty-six years since that afternoon planting cantaloupe in my father’s backyard, I’ve grown in emotional and spiritual maturity. Being raised in an evangelical church also contributed to my issues with perfection. I’m glad to say that I didn’t give up on my faith, but I have given up on perfection. I’m pretty sure that God’s okay with this, maybe even proud of me for it. Having been freed from the worldview that I have to be right about everything and that my friends either have to agree with me or we can’t continue to be friends, I no longer feel afraid of making mistakes, looking silly or utterly failing in my endeavors. 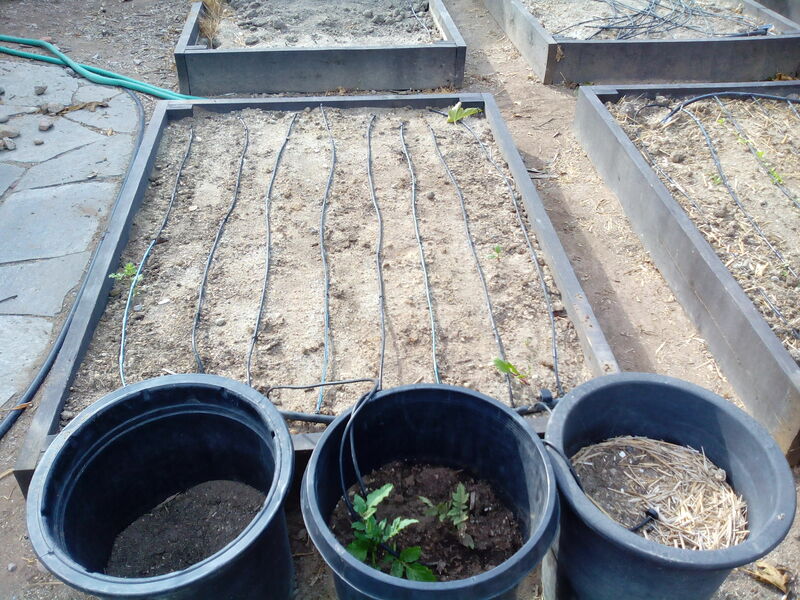 For example, once we got a house, practically the first thing I did was plant some vegetable seeds. Free from anyone telling me what to do and in the possession of my own land, I set to work. They did poorly because, as I know now, summer veggies need a lot of sun; and I planted mine under a tree. A failure that I’m glad I made. The funny thing is that I didn’t even view it as a failure. It was something I could learn from. There was still much more learning to be done. I now have 6 raised boxes in my front yard, 4 fruit trees, blackberry bushes; and I just started some worm bins. My “successes” have been few and far between, but I’ve definitely learned from all my failures, and they’ve given my urban farming experiment value. Fall seeds beginning to sprout in our urban garden. I finally see that pleasing my parents, or anyone else for that matter, and doing all the right things, is no longer my definition for success. I also no longer view the rejection of the comfortable life, the secure life or the life that everyone else is living as failure. My new definition of success is doing my best to grab hold of the good life, a life free from expectations, abounding in joy, and pursuing my dreams. Ultimate failure for me would be to be too afraid to even try to get hold of that life. Now, here I am on the other side of success, and I still have all those things that made my life appear successful. But I see that my journey, that my family’s journey, has only just begun. Through a lot of quirky events over the past 2 years, we’ve found that our journey is taking us to Thailand. We’re doing whatever it takes to get there. When I say whatever, I don’t mean it in a cutthroat way. I mean that we have begun asking ourselves “what does it take?” because this is a totally new approach for us. We may utterly fail in this endeavor, but at least we’ll succeed in trying. And I’m pretty sure that, whether we get there or not, we’ll find the good life somewhere along the way. What about you? What does success mean to you? How has/does this inhibit your own journey? succeed in trying – yes. the people @ bluesborough approve of this message.